Tammy Beaumont will have to put up with wearing the colour orange and likely not keeping for the Southern Vipers. “I hate the colour orange. That’s the most disappointing thing for me about the move, but I probably shouldn’t admit that! “I don’t see myself as a keeper but if I get the chance, I absolutely love doing it. 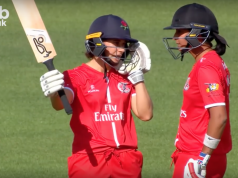 “Obviously I loved my time at Surrey stars, but the ECB allocate its England players still and they’ve decided to move me to the Southern Vipers as the great Charlotte Edwards and Lydia Greenway have retired in recent years. So they needed a batter down there to complete their allocation of England players. “I’d like to thank the Stars for a great two years and wish them all the best, but I’m really excited to join the Vipers. Beaumont is excited by the changes in format, which make the game twice as long, now with ten group games: “I think it’s going to be really good. “You saw in both versions of the Super League so far that the teams that start well tend to get to Finals Day. “You can actually build some momentum, if you’ve got home and away fixtures. It takes a little bit of that home advantage out. However, she acknowledges the increased travel could shock the younger players. “It’s going to be tougher because there’s a lot more travelling up and down. “Playing at the Ageas Bowl one day, two days later playing in Headingley and then back down to the Ageas Bowl. Next articleWhat could Morne Morkel bring to county cricket?